In our commitment to help you achieve all the makeup looks you desire, we have gathered 5 powder and cream bronzers commonly used for contouring fair skin. After hours of research and deliberation, we finally picked what we think is the best drugstore bronzer based on its ability to bring life to pale skin, usability, and longevity. The Master Strobing Stick Illuminating Highlighter by Maybelline is the only cream bronzer on this list. It is non-comedogenic and comes in stick form for an easy, hassle-free application. Go for the Contouring Blush and Bronzing Powder by e.l.f. for a 2-in-1 product. It comes in a travel-friendly compact case in case you need some quick touch ups while on the go. 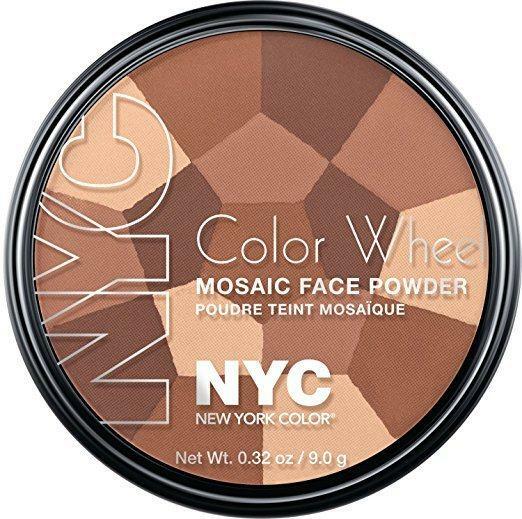 NYC’s Color Wheel Mosaic Face Powder is the most visually appealing product on this list in our opinion. It is also great for those with oily skin because it gives out a matte finish. The Hollywood Bronze & Glow by w7 is the second 2-in-1 item on this list. It is highly pigmented to ensure a striking look each and every time you use this product. Choose Milani’s Baked Bronzer for a streak-free, shimmery glow. It can be applied on the body as well for an even and radiant finish from head to toe. This, for us, is the best cream bronzer drugstore because it applies the “strobing” technique. This cream highlighter is also allergy and dermatologist-tested and is ideal for use by all skin types. The strobe effect basically means highlighting the face to create more dimension. This technique is the secret on how to get more glowing and radiant skin as if it’s lit from within. This lightweight cream bronzer is infused with micro-fine pearls for a targeted highlight with each use. It comes in stick form for an easy and mess-free application even beginners can use. People are really loving this best drugstore bronzer for fair skin. They like how this bronzer doesn’t give you dramatic results, how highly pigmented it is and how it doesn’t make you glittery. Great for starters, this product is available in two shades. They both come with an illuminating effect, so we guarantee you’ll turn out a better version of yourself regardless your skin tone. #2 Contouring Blush And Bronzing Powder By E.l.f. This is, no doubt, the best drugstore blush bronzer duo. It offers a natural, healthy glow with each use and comes in a travel-friendly case- perfect for instant retouches just when you need it. This blush and bronzer comes in a matte black palette with its two pans lying side by side. It is made of good quality and sturdy plastic with a lid that securely snaps shut with a single click. On top of that, it even comes with a decent-sized mirror inside the compact. That, for us, is impressive, considering how cheap this product is. The blush has a slight shimmer to it, but not too much to make you look like a disco ball. Texture-wise, it isn’t creamy and is a bit powdery, but it doesn’t mean it isn’t workable. The bronzer side of this palette is a bit tricky though. Like the blush, it comes with a light shimmer and tends to be crumbly and soft so extra caution must be observed when using it. We think this is the best drugstore shimmer bronzer because it gives you just the right glow in places where it’s needed. Plus, it is available in three shades, so there’s likely a perfect match no matter what your skin color is. Its ability to keep oil at bay makes this the best matte bronzer drugstore. It gives out a natural, soft finish and brightens up your skin so you don’t end up looking like a zombie brought to life. From the name itself, this matte bronzer consists of 4 harmonizing hues in each pan. Combined, these colors then make a single shade to enhance and balance whatever your undertone is. Sounds like a work of art for us. Loved by a lot of people, this best drugstore matte bronzer for contouring makes makeup look like it’s done by a pro. It also lasts the whole day and offers great coverage for a flawless look. However, we think that issue is workable considering how great and awesome this product is. The best part is it won’t cause any breakouts, making it ideal even for those with sensitive skin. This best drugstore bronzer and highlighter is a must for people who want to make a statement. The bronzer allows a great tanned look plus the highlighter gives your features more definition. The product comes in a plastic, rectangular bronze palette which honestly, we aren’t fans of. It just feels and looks so cheap that we feel like they could’ve taken more time to think it over. It also comes with a small, thin mirror. But, then again, we found it useless as you cannot use it in applying the powders. Oh, well. Let’s proceed to the interesting part. The highlighter and bronzer of this product both have a slight shimmer to it. Though warm, we find the bronzer too orangey, but again, the little shimmers make it more attractive and pretty. The highlighter, however, comes in a warm champagne color which is more on the peachy side. It also is much glittery than the bronzer, which comes out pretty nice when applied on the skin. Overall, we feel like this is the best inexpensive drugstore brand bronzer since you get more of what you pay for. The brand is known as a maker of “dupe” products, but this definitely isn’t one. We regard this as the best drugstore bronzer for pale skin because it instantly gives a dash of color to your skin. It gives out a subtle, beautiful glow, and is nowhere near powdery or chalky. The bronzer, in our opinion, is very pretty. Unlike other bronzers that look “flat” and boring, this comes with a swirly effect which, according to the site, resembles the terracotta tiles in Italy. This product comes in 3 different shades, and all have a peachy bronze to them with golden swirls. Perhaps it’s the gold content of this product that makes it very wearable? With that, this product is so easy to apply and can be worn on its own or on top of your favorite blush. It also comes with a soft brush which does not shed and we can say is of good quality. The product’s packaging, unfortunately, is a major fail. Aside from looking cheap and ugly, it is also impractical as the hinge seems of low quality and tends to jiggle around. This then leads to the bronzer knocking against the lid, allowing it to end up being cracked. The pan also sometimes snaps off or comes off. This makes us really sad because the packaging really doesn’t do much justice to this wonderful product. If you’re a makeup newbie, contouring might be the last thing on your mind. Learning how to apply makeup is already hard, so why make it even harder by learning how to contour? We hear your sentiments, but contouring has its benefits especially for pale skin. It can make you look more alive and vibrant and it can make your makeup look on point all the time. Now that we have your attention, here are the ways on how to apply bronzer the right way. Darkening your complexion in a subtle way is the main purpose of bronzers, so as a general rule, your natural skin color must be at least two shades lighter than the bronzer of your choice. To test, apply a small amount on your face and see if it “warms” your complexion without it looking fake. A bronzer that’s honey-colored works best on fair skin. It is also ideal to pick two different bronzers: one during summer (when you’re tan,) and one during winter (when you’re pale.) This will ensure the uniformity of your bronzer the whole year. Fluffy, wide brushes with a round top are best for applying bronzers, since stiff and small brushes offer blotchy results. Though brushes especially made for bronzers are currently sold in the market, a large foundation or blush brush will do the trick. A bronzer is only applied after wearing foundation and concealer. This allows for a smooth canvas before contouring. Just make sure to blend all the way down your neck to make it appear more natural. This is to ensure that you’re letting the color build-up, instead of adding a dark layer all in one go. You can do this by lightly coating the tip of your brush with the bronzer and tapping off any excess into the container. A bronzer should only be applied on areas where the sun is more likely to hit your face. This includes the top of your forehead, your cheekbones, and your jawline. It’s basically making a figure “3” on your face using gentle, feathery strokes on both sides of your face. This is to make sure it doesn’t look to heavy and still looks even. In case you applied too much, use a cotton pad to blend it down or you could try applying base powder a little more. We think people with fair skin will benefit the most from bronzers. Yes, it might need a lot of practice to perfect, but we promise you it’s all going to be worth it. We have chosen the Master﻿﻿﻿ ﻿﻿﻿Strobing Stick Illuminating Highlighter by Maybellinye as the best drugstore bronzer. This highlighter comes in a creamy formula to make application a breeze. It is packed with micro-fine pearls to ensure a targeted highlight for more glowing skin. This product also swivels up (just like a lipstick!) so even newbies won’t be intimidated in using this. So you basically just have to let some product out of the container, apply a thin layer on your face, and then blend away. And can we stress out how inexpensive this is? Even those with a tight budget can afford this, so there is no excuse to not have this product in hand.